Minnesota topped the nation in voter turnout in 2018 (MPR). This isn't really news. It reflects Minnesota’s civic engagement values and the effects of forward-looking reforms, such as same day registration, that were made in the 80s' and well-run registration and elections management system. While Minnesota leads in voter participation we are lagging in important ways, according to Minnesota COMPASS there is a declining trend of voter participation during non-presidential years, and people of color are voting at a rate 27 percent lower than the overall participation rate. A 2018 Minnesota Legislative Auditor's Office report on voting practices in Minnesota cited steps that could be taken to modernize the state's voter registration systems. Election systems throughout the country, including Minnesota's, are vulnerable to cyber attacks (MPR) and are in need of immediate and sustained investments to upgrade protections. Participation Gaps Exist for People of Color and young people. While Minnesota COMPASS reports document under participation by people of color in Minnesota elections, this Great Lakes Region Study shows there are real barriers preventing participation. One of the most troubling findings in the poll confirms that inequities exist and that people of color experience more barriers to voting than their white counterparts. African American and Latino voters were two to three times more likely than white voters to report that they or others in their household had trouble exercising their right to vote (other studies reflect the same results of Asian Pacific Islanders). Younger voters, those age 18-29, also reported experiencing problems at a much higher rate than other age groups the last time they tried to vote. Reforms, such as automatic voter registration are supported and effective. According to the Great Lakes Region Study, 64% of Minnesota voters support voter registration; including support across all demographics and survey measures including race, gender, age, and party. Regardless of what political parties think, the broader public wants more voter access not less. The nation's initial experience in Oregon with automatic voter registration resulted in creating a voter registration base more reflective of the state's demographics (Center for American Progress). Beyond changing the profile of who is registering, AVR can help close disparities in participation (Demos). Additionally, this approach to modernization addresses concerns about effective and efficient election management (Brennan Center). More and more states are adopting this approach to modernizing and expanding their voter engagement systems (National Conference of State Legislatures), and support has been bipartisan (Christian Science Monitor). Basic voter education cannot be ignored, and grantmakers can do their part. The Great Lakes Region Study also documented a large knowledge gap when it comes to what the current voting rules are. Results from Minnesotans responding to the study's survey revealed that: 60% of Minnesota residents are not sure if someone can vote without a permanent address, 51% are unsure if you can vote if they are late in paying taxes, 49% are not sure if voting is allowed if you have an outstanding traffic ticket or unpaid utility bill, and •33% are uncertain whether citizenship is required. People don’t know; a lot of people don’t know basic information about voting. Grantmakers can step up their efforts to complement public voter education, particularly in communities where voter engagement is disproportionately low. MCF public policy advocacy supports the goal of creating prosperity through inclusion and equity. To advance that goal, we support policies that strengthen democratic institutions and civic engagement, including advocating for policies that promote voter access and confidence in our voting systems. Investment in community-based voter education and engagement by Minnesota grantmakers. 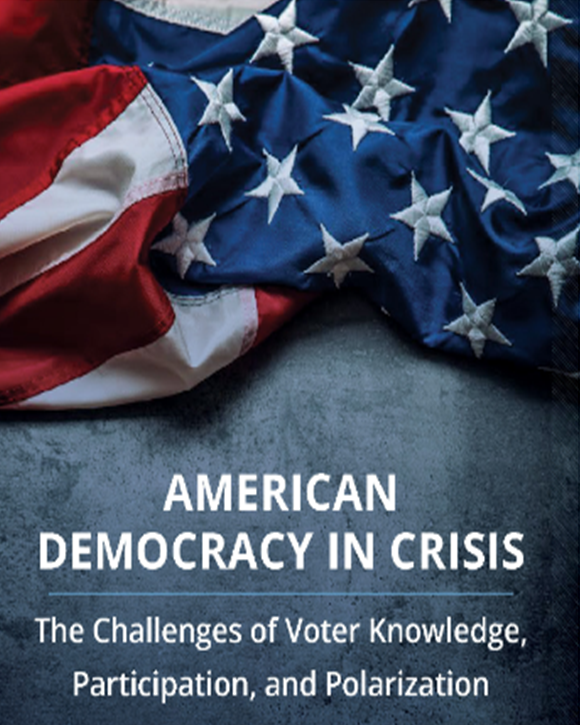 The American Democracy in Crisis: The Challenges of Voter Knowledge, Participation and Polarization study will be completed in February 2019, and published later in the spring. The Joyce Foundation, together with McKnight Foundation and Kresge Foundation are supporting this effort to learn about how all Americans, and especially those in the Upper Great Lakes region, experience and perceive democracy. The research is conducted by PRRI (the Public Religion Research Institute) with coverage by The Atlantic exploring challenges to democratic institutions and practices. The Joyce Foundation, together with our colleagues at McKnight Fdn (MN) and Kresge Fdn (MI), are supporting this effort to learn how all Americans, and especially those in this part of the country, experience and perceive democracy. Read more about MCF's views on voter engagement in MCF's Giving Forum magazine.